We would like to firstly apologise for taking so long to getting back into the swing of things. Our initial date had been January 2019 however unforeseen delays meant we had to keep pushing our dates back. Not only do we have a plethora of new features on our website (and more to come soon) but we also have some new games! Firstly, we are introducing Quests. Quests will reward those players who use our website with additional rewards. Now when you play a tournament, league, or challenge match you can not only receive the competition reward but unlock additional bonuses. You can find all the Quests here. Introduction of ELO System. Experience points will be given to teams based on positions within the ladder. Introduction of The Crown. One team per ladder will hold the ladder Crown. If your team has this Crown, you’ll receive double experience points per ladder match win. If your team wants the crown, simply win the crown in a ladder match! The re-introduction of Team Avatars. The introduction of match dispute comments. Lost a match and not sure why? Now admins can provide the reasons for each match they resolve. In addition to these large updates, several bug fixes were made and several tweaks to each individual ladder have been carried out for maximum user satisfaction when competing! Finally, we have updated our logo and social media branding to a new more modern look. 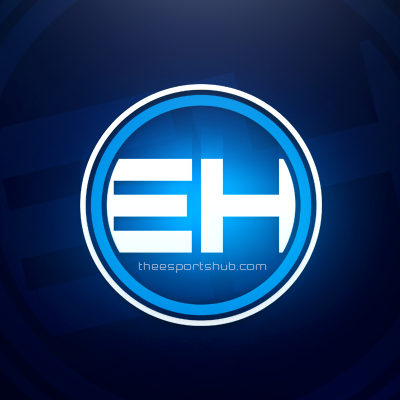 Our previous logo that consisted of the EH within the circle has been replaced with a bold ESHUB. We felt this more accurately reflects The Esports Hub brand and creates a more modern persona surrounding the brand. We are not done just yet! Our largest update, Challenges, is not quite ready however we felt that most of the testing has been completed and we can resume our daily operations while we tweak and polish the final product. We understand that you may be frustrated that our new project is not ready, however we cannot emphasise just how much work has gone into Challenges. We can share that Challenges are our take on wagers; we have developed a system that is more stream-lined than a traditional wager match and will provide more opportunities for the player to earn more prizes, be rewarded for competing on our platform on any game and not be obliged to pay any fee's when taking our an ELITE membership for a reduced price. We are truly excited to share this with you as this is our biggest project to date. We are not done just yet. Just around the corner are some changes to our free-agent system and our online store. These changes will come after the release of Challenges and we will be providing more information on what these updates are, very soon! In addition to the above changes you may see some new games popping up, including the massive-hit Apex Legends! Watch out for Apex competitions as they will begin very shortly! Tournaments and league play will resume on Monday 11th of February. To celebrate the return of The Esports Hub, we will be hosting free-to-play tournaments with money prize every weekday of February! In addition to this, a Call of Duty league will be announced very shortly – stay tuned to find out the details! We look forward to updating our website with more content as the weeks go on.